Check out the latest shoeing boxes, power tools and rigs from some of the industry's leading suppliers. For more than 20 years, farriers across the world have confidently chosen the Cobra line of shoeing boxes to work beside them every day. You are going to love four wheel drive for your shoeing box! 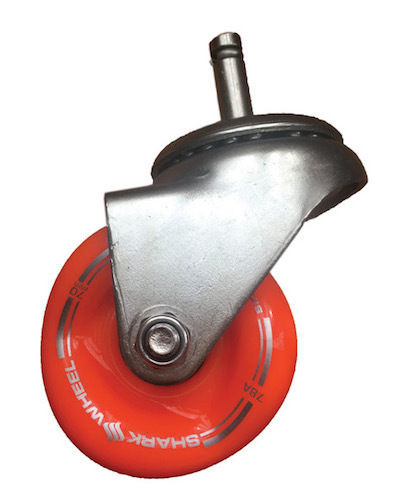 The revolutionary new Shark Wheel System By Farriers Depot has changed how you use your shoeing box. No longer is it hard to roll your farrier box through shavings, uneven barn surfaces or muddy paddocks thanks to a patented wheel pattern and caster system. Having your box topple over when it hits a rock is a thing of the past. Shark Wheel’s feed back has been amazing. Check it out! “Shark Wheels saved my back from having to carry my box all over the show grounds.” — Roy V.
“They work fantastic and are super quiet.” — Wade H.
“First horse of the day slammed into my box. Normally it would have flipped over, but with the Shark Wheels it just rolled down the barn aisle.” — John N.
Click here for more information about Shark Wheels. 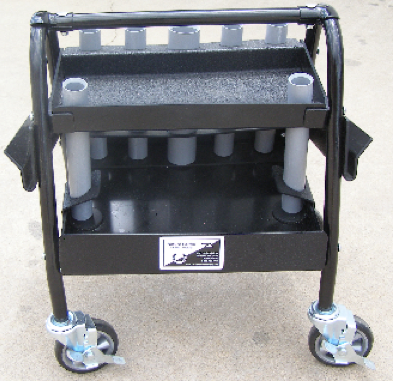 Tooljack® by Equine Innovations Inc.
Tooljack® is an innovative shoeing box available in 2 sizes. Made of the same tough material as the Hoofjack®, the Tooljack® is quiet, stable and durable. The top tool bar keeps your tools organized, visible and at working height. Several magnets are included for holding tools such as rasps or nails. 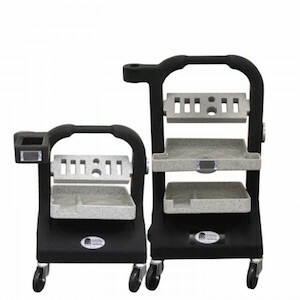 The accessory holster can be used with optional trays to provide more work space or storage. The Tooljack® is easy to customize and is made in the USA with a 3-year warranty against breakage by equines. KEYWORDS Cobra Elite from Nature Farms power tools rigs Shark Wheel System By Farriers Depot shoeing boxes Tooljack by Equine Innovations Inc.